By Keith Cowing on November 2, 2011 8:05 PM. - Rohrabacher: DOJ says that WH can do whatever it wants in terms of diplomacy. My colleagues and I will fight this overreach. - Rep. Carnahan: I have a different view on how we can engage with China and push ahead with reforms. - Rep. Wolf "NASA wants to work with the PLA who is killing people for their organs"
- Rep. Wolf is now showing posters and shouting. - Bolden: my predecessor travelled to China to talk about space cooperation while GW Bush was president. I travelled there in 2010. "Rep. Frank Wolf, chairman of the House Commerce-Justice-Science Appropriations subcommittee, today asked the Justice Department to hold the head of the White House Office of Science and Technology Policy (OSTP) accountable for breaking the law for leading science policy discussions with China." Keith's earlier note: Originally Rep. Wolf, John Holdren, Charlie Bolden, and Thomas Armstrong were all on the same panel. Now Wolf is on his own panel - with Holdren, Bolden, and Armstrong on a separate panel from Wolf. Certainly sounds dysfunctional and potentially confrontational to me. While NASA TV will air the hearing, there is no mention of this hearing being carried live at C-SPAN television, C-SPAN radio, or at the House Committee on Foreign Affairs website. So much for openness and transparency on Rep. Wolf's part. 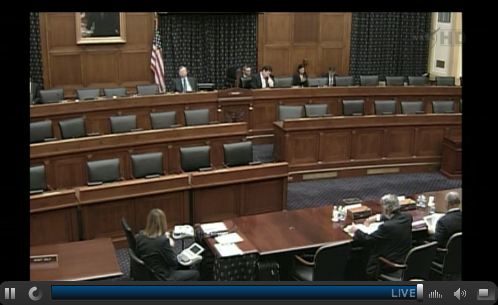 \n\n Keith's note: As you can see from this screen shot from the hearing's webcast (shown only on NASA TV) as John Holdren and Charlie Bolden were testifying, that virtually no one other than Rep. Rohrabacher, ranking member Rep. Carnahan, and their staffs even bothered to show up for this hearing. A few selected tweets:\n\n- Rohrabacher: DOJ says that WH can do whatever it wants in terms of diplomacy. My colleagues and I will fight this overreach.\n- Rep. Carnahan: I have a different view on how we can engage with China and push ahead with reforms.\n- Rep. Wolf \"NASA wants to work with the PLA who is killing people for their organs\"\n- Rep. Wolf is now showing posters and shouting.\n- It is now clear why Rep. Wolf needed his own panel - he is taking up the time that 3 witnesses would normally take\n- Rep. Wolf is showing more posters and shouting about China blocking UN missions\n- Bolden: my predecessor travelled to China to talk about space cooperation while GW Bush was president. I travelled there in 2010.\n- Rohrabacher: this came to you from DOJ? Holdren: DOJ's opinion represents the Administration's opinion on this matter & it is binding on me\n- Holdren: WH asked DOJ lawyer to be present - that request not granted by the committee - Rohrabacher said he would have granted had he known\n- Most absurd aspect of the China/OSTP/NASA hearing: Committee staff refused to allow a DOJ rep to explain its decision for WH to follow\n\nHearing: Efforts to Transfer America's Leading Edge Science to China\n\n- Rep. Dana Rohrabacher (subcommittee chair) - statement\n- Rep. Carnahan (ranking minority member) - No prepared statement\n\nPanel I\n- Rep. Frank Wolf - statement/press release\n\nPanel II (new)\n- Thomas Armstrong, Managing Associate General Counsel, GAO - statement\n- John Holdren, OSTP Director - statement\n- Charles Bolden, NASA Administrator - statement\n\nPanel III (new)\n- Rick Fisher, Senior Fellow, International Assessment and Strategy Center - statement\n- Adam Segal, Ph. D., Senior Fellow, Council on Foreign Relations - statement\n\nOffice of Science and Technology Policy--Bilateral Activities with China, October 11, 2011\n\n\"Section 1340 prohibits OSTP from engaging in bilateral activities with the government of the People's Republic of China or Chinese-owned companies unless specifically authorized. Because OSTP was prohibited from using appropriated funds to participate in the Innovation Dialogue and the S&ED, OSTP violated the Antideficiency Act.\"\n\nWolf Asks Justice Department to Hold White House Science Adviser Accountable for Breaking Law\n\n\"Rep. Frank Wolf, chairman of the House Commerce-Justice-Science Appropriations subcommittee, today asked the Justice Department to hold the head of the White House Office of Science and Technology Policy (OSTP) accountable for breaking the law for leading science policy discussions with China.\"
This page contains a single entry by Keith Cowing published on November 2, 2011 8:05 PM. Steve Squyres is the new NASA Advisory Council Chairman was the previous entry in this blog. Photo: On Orbit and Backlit By Earthshine is the next entry in this blog.